HowDoesShe display kid’s art – 28 ideas! How Does She display kid’s art? I knew I could find a few ideas, I had no idea I would find this many!!! I am excited to present all these awesome ideas – I am so inspired to get my kids to make more art, just so I can display it! This is Alison’s idea to take lots of art, shrink it on the computer and put it into one collage. Child’s art 18 into 2! I love this idea because it is so easy to update whenever you want and it looks GREAT! The Style Files shares this picture. I love all the colors against the white wall. You can get these curtain holders at Ikea, not online, unfortunately, but if you live by one – lucky you! Blissfully Domestic has a great tutorial on displaying framed art. Turn it into art on Canvas!!! This is one of my favorite ideas – pretty much anything on canvas just looks classy. get it for free at Canvas People – click here! Turn it into custom wall paper art, a laptop skin, or a removable sticky picture at SticViews – You can still get one free – see this post to find out how! Turn doodles into a real work of art – Summer from Fine Doodles does some amazing work with your kid’s doodles – you gotta check out her website! #3 Take it with you and show it off! or Totally out of Hand will turn it into silver or gold jewelry! Snap Totes will turn images into bags or pillows – picture your kid’s art on the bag above. I made one for my son and he thinks it is the coolest thing! 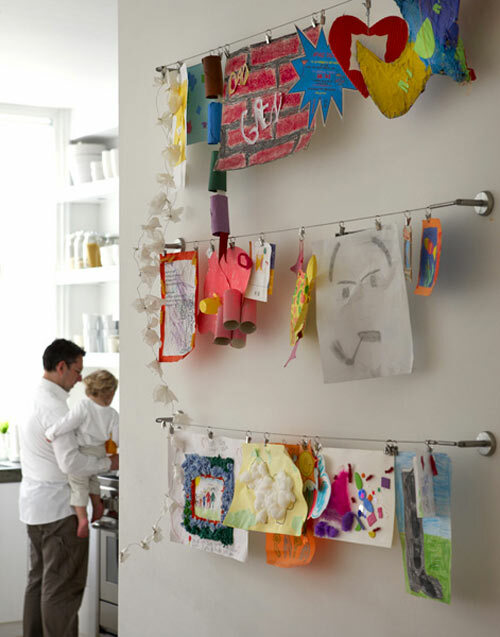 How do you display your kid’s art? I made my own Art Display Board using a 2×4, some paint and clothespins! 🙂 The kids love to swap out their artwork. wood glue and some clamps should do the trick! I have been going thru all the art folders my 4 kids have brought home over the years. Couldn’t bear to throw them away, so I photographed the best ones and saved them digitally! Now I use them to decorate blog posts, Facebook posts, etc. I’m having fun showing off original works of art one by one. Love the canvas people idea!! Thank you for sharing. Some of the ideas are so creative. I have been thinking of how to display my kid’s art all the time. I will try some of them! I used some wire and nails and made my own display line similar to the ikea shower bar. I love the shower bar though it looks a little nicer. Maybe next time I’m near an Ikea store I’ll upgrade. I just posted in the last post, and forgot another way we’ve displayed art at home… We also have a narrow hallway upstairs and have a “gallery” wall – 4 or 5 framed pictures of our favorites are on display up there. One day when they were on sale I got a bunch of matching frames just for this idea. Each of the kids display their artwork on their own bedroom door. That way when they are bringing home holiday decor, it goes with the season. Take a pic of child in front of door to have a lasting picture of them and their art. Then you only have one picture to hold onto and the door decor gets refreshed. DO you tape them on the door? I’ve thought of that too, but if it’s something I want to keep, I don’t want the tape to ruin it (usually when I take tape off it makes a hole). LOVE these ideas! Our formal dining room is our playroom/art room and darling daughter has started taping her artwork to the wall. While the room DOES need painting, I surely don’t want tape on the walls! I’m going to Home Depot tomorrow (Ikea is 1.5 hours away in Orlando) to look for parts that would be similar to the shower bar and wire….. what a great idea! I am a painter and collage artist and the fertile imagination of my two boys gave me the idea to recycle their art and craft items to create an original mixed medium work of art on canvas. Very contemporary and fresh looking! Hope you’ll talk about my collages as I have clients sending me their kids art from as far as Belgium – I’m in Montreal! Such great ideas! I am sharing this on Pinterest.